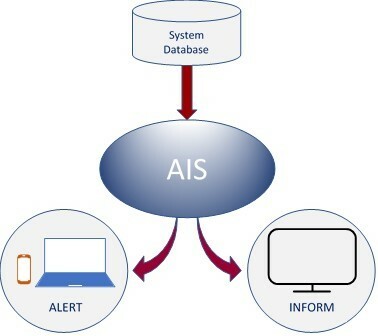 AIS-Alert notifies support personnel when critical events occur within the authorisation system or when certain thresholds are reached which indicate that problems may exist with transaction processing. For example, an alert would be raised if Visa had been offline for more than five minutes or the system had recorded 100 or more declined transactions within the last five minutes. The criteria for raising an alert are set by parameters within AIS-Alert, and the alerts can be classed as Fatal, Warning or Information. The above examples would be classed as fatal and a visible alert in the form of a red �traffic light � and status message would display on the AIS-Inform screen. A warning email could also be sent, together with an audible alert, and a text or pager message to key staff, raised through an existing alert system or an email SMS gateway. AIS can also notify branch staff by email or SMS text about error conditions for a specific ATM, such as low on cash or paper out conditions. All alerts are recorded in an audit log viewable in AIS-Inform.